Hey guys, welcome to this Mometrix video on characters in literature. Characters are an essential part to any literary work. They make the story possible, and, the way in which the characters are built, can help to bring the story to life. 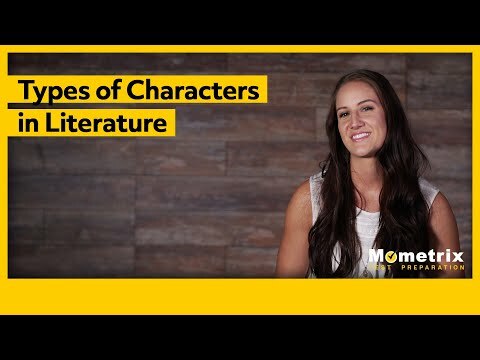 In this video we will take a look at the definition of a character (within literature) and then we will look at character development, and the different types of characters. What is a literary character? A character is any animate figure within a story. So, things like plants and non-living objects would not normally be considered characters, unless of course these things have been personified and brought to life. A character’s development speaks of the depth and complexity of a character. It’s possible that a character starts out thoroughly developed, or it may be that the author chooses to slowly develop that character as the plot unfolds. It can also be the case that a character starts out highly developed, but the reader is not made aware of certain aspects of their development until later. Main characters are essential to every story. Main characters are the characters with the most amount of influence on the plot or the characters that the plot has the most influence on. There are a few different ways in which you can classify main characters in a story: flat or round characters, protagonist or antagonist, and dynamic or static characters. Flat characters are often described as characters that are two-dimensional. Meaning that they lack real depth or are not super complex, nor do they show much development throughout the story. Round characters can be thought of as three dimensional. These are the characters that are realistically complex, and have depth that is identifiable and distinctly humanlike. Round characters will show development in ways that engage or astound the reader. A protagonist is always a main character in the story. The protagonist prompts a story’s action and captivates the reader’s attention. In most cases the protagonist is the character that the readers will experience empathy for. He or she is generally the hero or heroine, and is very well developed, complex, and relatable. This is the character that the plot builds around. The antagonist is directly opposite to the protagonist. The antagonist works against the protagonist. They are usually the bad guy or girl in the story. The antagonist generally evokes a disapproval within the reader, and generally works to add to the readers empathy towards the protagonist. The antagonist also helps to create action and move the plot. Dynamic characters are directly connected to character development and refer to a character who undergoes change within a story. They are characters that the reader watches develop. Most often a protagonist is a dynamic character. For example, a character may start out closed off, and throughout the course of the story they begin to let some of those walls down. Unlike dynamic characters, a static character is a character who does not change. A static character is often times the antagonist in the story. They refuse to change their actions or the way that they think; they are stuck in their ways. Their purpose is generally to show a contrast to dynamic characters. Now, let’s spend a little bit of time looking at how round and dynamic characters are different, and how flat and static characters are different. A round character is a character who is three dimensional, or very complex and realistic. However, a character can start off as a round character, but not change. If a character has depth and is complex it is a round character, and if it does not undergo a change then it is a static and round character. If a character is complex, and realistic, but also undergoes change then it would be a dynamic and round character. So, a dynamic character is just a character who undergoes change, and a round character is just a character with realistic depth, and complexities. On the other side of that a static character can be a round or flat character. Static just means that the character does not undergo change, or like I said they are stuck in their ways. A flat character just means that the character lacks depth, and a sense of realness. It is a two dimensional character. I hope this this video over characters in literature has been helpful. If you enjoyed it then be sure to give us a thumbs up, and subscribe to our channel for further videos. See you guys next time!